It’s almost back to normal time around here at TokuNation.com after spending the last week in San Diego, California. And for those of you who have purchased all the items you needed from SDCC 2014, it’s time to get ready for the next round of monthly shopping to begin! Our friends and site sponsor BigBadToyStore.com have put out their latest newsletter showcasing some of their new arrivals and new pre-orders in the store! Check out the new toku item pre-orders below! Some great new items listed! Don’t miss your opportunity to pick yourself up that hot looking S.H. Figuarts Kamen Rider Duke … a dealer at SDCC 2014 was selling the other S.H. Figuarts Kamen Rider Gaim figures that have been released at a 85% mark-up and he sold out by Thursday! To see the whole newsletter, simply click “Read More”! 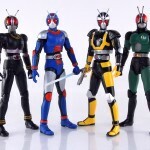 Be sure to pay our friends at BigBadToyStore.com a visit and tell them TokuNation.com sent you! 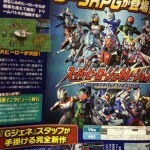 Super Hero Generations is a new Super Robot Wars esque tactical RPG from Bandai Namco Games that features Kamen Rider, Ultraman, and Gundam. The official webspite for the cross over title just launched. Along with the web site, screenshots showcasing the gorgeous attack animations for Wizard, Ginga, and Black RX have been released. What sets Super Hero Generations apart though is that the characters will appear in full proper proportioned bodies during the cutscenes and not Chibi styled as per Super Robot Wars tradition. The game will be released on PS3 and PSVita consoles with both Special Sound Editions and regular retail editions available and will be released October 23rd 2014. The Regular edition on Ps3 will cost 7,600 yen with the special sound edition being 10,450 yen while the Vita version will be a little cheaper at 6,640 for the Regular and 9,500 for the special edition. Super Hero Generations Game Announced! 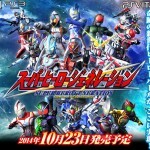 Once again the Kamen Rider, Ultraman, and the Mobile Suit Gundam franchises will be joining together in a new crossover title: Super Hero Generations which was just announced for PS3 and PS Vita consoles! 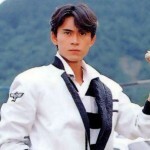 From our side of the fandom, the game will include Ultra Seven, Ultraman Zero, Ginga, Tiga, along with Kamen Rider Fourze, Black RX, Wizard, Den-O, W, and 000. The game itself is a grid based tactical RPG ala Super Robot Wars. Yet another of last night’s revealed figures is now confirmed with official images and release info! This time we can share images of S.H. Figuarts Roboizer! The sweet ride of the Prince of Sadness himself, Kamen Rider Black RX’s 2nd form, Robo Rider! This latest addition to the S.H. Figaurts line will likely come with the standard accessories most rider bikes tend to, a display stand and extra handlebars. S.H. Figuarts Roboizer will be released as a Tamashii Web Exclusive in October for 4860 yen! Well that was quick! Our second & third new reveals of the night are S.H. 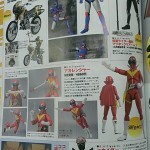 Figuarts Roboizer & S.H. Figuarts Green Clover! S.H. Figuarts Roboizer is the signature bike used by Kamen Rider Black RX in his Robo Rider form. This sweet ride will be a Tamashii Web Exclusive for October release for 4860 yen. Meanwhile S.H. Figuarts Green Clover, the personal machine of Kamen Rider Leangle from Kamen Rider Blade, will also be a Tamashii Web Exclusive this October for 4536 yen. S.H. 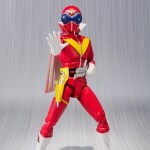 Figuarts Aka Ranger & Bio Rider Official Images! File this under pleasant surprises. Apparently scheduled for release in September 2014 are two long awaited releases. S.H. Figuarts Aka Ranger from Himitsu Sentai Goranger. You may recall that this figure hasn’t been seen since it was displayed at Tamashii Features Vol 3 in 2012. And then there’s S.H. 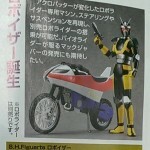 Figuarts Bio Rider from Kamen Rider Black RX who was only glimpsed thanks to SHFindo back in March! Release details haven’t been confirmed for either figure yet, but the Tamashii Web Page is stating these will be released in September. And they’ve provided several official images of each figure!